WANT TO WRITE TO “Perihelion” Science Fiction? Want to rave about a particular story? Want to express an opinion about something in science or science fiction? Want to tell us what you think about almost any topic under the Sun? You’ve come to the right page. Use the space below to leave us a Comment. Perihelion Science Fiction is copyright © 2018 by Sam Bellotto Jr. ISSN 2328-675X. All rights reserved. Published in the United States of America. Any reproduction of content by mechanical or electronic means without permission is strictly prohibited. All other copyrights, trademarks, service marks, and logos are the respective property of their holders. 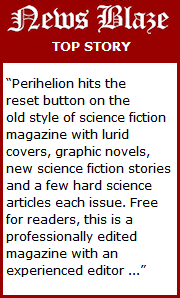 For information about submitting to Perihelion Science Fiction, please refer to the submission guidelines. Perihelion Science Fiction welcomes material submitted by any writer and generally responds in one or two months. Please send all email to editor at perihelionsf dot com.